Of the Microsoft Project features dealing with resources, a big chunk is used to spot resource overallocation. Overallocation is a calculation involving the resource’s calendar and availability. So, consider Monica Melendez, an engineer who works a standard eight-hour day based on her calendar. Monica is assigned to the Write Final Report task at 50% of her availability and to the Create Design Specs task — which occurs at the same time as the report task — at 100% of her availability. Monica is now working at 150% of her availability, or 12 hours per day. Poor Monica is overbooked. By default, a resource is assigned to a task at 100% availability, but you can modify that if you know someone will be busy with several tasks and is likely to put in only part of their time over the course of a task. Availability is easier to estimate for some than for others. A manager isn’t likely to give an entire day over to any single task because he has to deal with all the people who report to him, sign authorizations, go to meetings concerning various projects, work on budgets, and so on. With a production worker, it might be simpler to pin down availability to a single task: If one manufacturing job is going through the line for three days and that person is working on the line all that time, it’s closer to the mark to say that he or she is working on that task full time. One big mistake that new users of Project make is to micro-think availability. Of course, no one actually spends eight hours every day on a single task in one project. People spend part of their days reading e-mail about company holidays, chatting with co-workers, and answering phone calls about non-project-related stuff. A resource might spend seven hours on a task one day but only three the next. Don’t get hung up on a day-by-day resource schedule in estimating availability. If over the life of a task the person is pretty much devoted to it, 100% availability is a good setting. If that person will put in only, say, five days of work on a ten-day task, whether they work four hours a day for ten days or five full days at any point, that’s 50% availability. Remember, the availability setting is there to help you spot overbooking of a resource that might work on multiple tasks at the same time in a project schedule. 1. Display the Resource Sheet view. 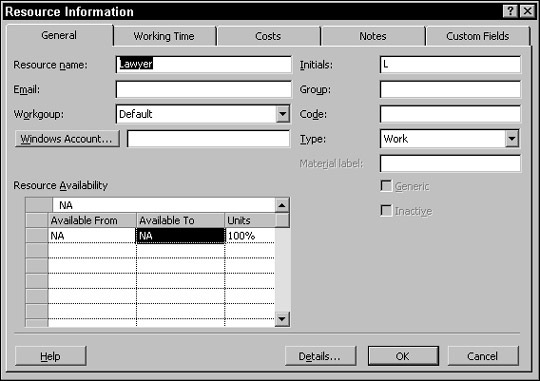 The General tab of the Resource Information dialog box appears, as shown in Figure 1. Figure 1: You can enter any number you like in the Units box. 3. In the Units column (in the Resource Availability area), click the arrows to raise or lower the availability in 50% increments or type a number. For example, type 33 for a resource available a third of the time, or 400% for a pool of four resources all available full time. The most common entry here is 100% for a single resource working full time on the task. 4. Click OK to save the setting. In addition to being available only a certain percentage of the time on any task, a resource may be available for only a certain period of time during the life of the task. Another scenario might be a resource that is available half time for the first few days of the task and then full time for the rest of the task. In that case, you enter a date range in the Available From and Available To columns of the Resource Availability area in the Resource Information dialog box (see Figure 1) to specify varying availability.